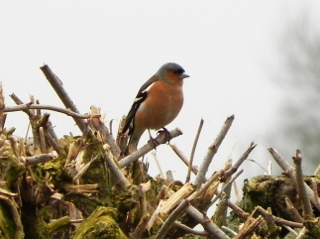 Chaffinches in Sweden tend to be on the macho side. Linnaeus noticed that all the females pack up and move out over winter, leaving the males to go hunting and trapping and to spend their time sitting around log fires, while the sauna heats up, telling tall tales with their mates. When he was sorting out which bird was what, Linnaeus decided to give the Chaffinches the Latin equivalent of ‘bachelor’ as their name. In the 15th Century – that’s around 1400 and something – I do wish either the centuries had lined up better or that people who use the ‘somethin-th century’ would just say what date they mean. The whole problem is that the first century happened in the years before we had counted up to a hundred. Let’s not even go into that problems they caused because they started counting from year one and not from year zero. So the years one-hundred-and-something were all in the second century. It was only a hundred years, you’d have thought we could have waited until it was over before we started counting, wouldn’t you? Any way, as I was saying, in about 1400, Abbott Robert Bruyning thought it would be nice to have one of these Missal thingys that were all the rage, so he set a few monks to work. The really interesting thing about the Sherborne Missal, as it came to be known, is the pictures of birds that decorate some of the pages. Some of them are a bit on the mythical side but there, in the bottom corner of page eighteen, is a really good picture of a chaffinch. Chaffinches have so many names, they’ve forgotten most of them, but ‘they’ say that the finch part comes from the “fink, fink” of its call.